Women have always formed organizations. Before the twentieth century, when governments had few social programs, Virginia’s women founded orphanages and schools and supported missionaries. Society deemed these activities appropriate for women to create or direct as extensions of their family responsibilities. Other women organized to speak out on social issues that had political ramifications, such as temperance, slavery, and other moral reform issues. Women's exchanges, active in several Virginia cities in the decades before 1900, linked elite white women with poorer women of both races to provide a community marketplace for goods that women created in their households, an essential source of income for many families. In numerous towns and most cities, both white and African American women formed clubs to bring women together to socialize, discuss their reading, hear speakers talk about major issues of the day, and contribute to community projects, such as schools or theaters, and provide other public services. 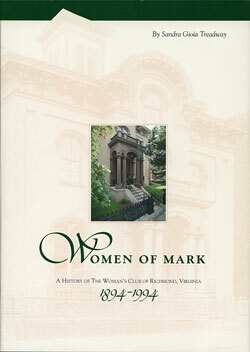 Women's clubs not only brought women in a community together, the clubs also connected them to statewide and national networks through such organizations as the Virginia Federation of Women's Clubs and the National Federation of Colored Women's Clubs. These clubs often played influential roles in furthering the work of social reform movements. During the long period of racial segregation in Virginia, African American women played influential roles in their communities through their own clubs and organizations. Because organizations served many purposes, professional associations, such as the Business and Professional Women's Clubs, often bridged the gaps between women's private and family lives, their professional careers, and public life where they took part in political debates and decision-making that also affected all aspects of their lives. Active club women helped form and provided the expertise and staff for some of the first social service and public health agencies of Virginia's state and local governments.